It’s getting cold outside and just like us our four legged friends can feel the effects of winter’s cold chill. As the temperature drops, it is important we make sure our furry friends are kept happy and healthy throughout the season. Here are some tips on how you can keep your pet safe and happy this winter. Some dog breeds manage colder temperatures better however, ideally, your pet shouldn’t be kept outside for long periods during winter. Like humans, dogs can suffer from hypothermia and frostbite. For cats, consider installing a cat flap for easy access to your house and keep your cat indoors at night. For many councils it is a legal requirement for cats to remain inside at night. Give indoor pets access to comfortable bedding, raised off the floor, away from cold drafts. 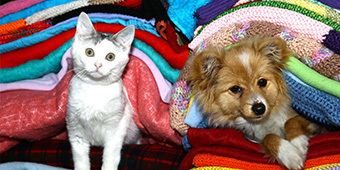 Try to keep a heater free area for your pet. While your pet may enjoy getting up close to heating, they run the risk or receiving burns and dehydration. Always have fresh bowls of water available for your cat and dog whether they are indoor or outdoor pets. Avoid having your dog’s coat clipped close to the skin during winter, as longer coats provide more warmth. Also minimise bathing your pets in the cold as this can remove essential oils from your pet’s skin and fur, increasing the chance of skin irritation. Brush your pet regularly to get rid of dead hair and stimulate blood circulation. This can improve skin condition. Cold weather can be hard on your dog’s paws, leading to chipping and cracking. After an outdoor walk, wash your dog’s paws in warm water to remove salt and chemicals. You can also apply Vaseline, a great salt barrier, to your dog’s paws before a walk to minimise damage. It is important for your pet to remain active in winter. For dogs make sure you stick to regular exercise routines during the colder months. Off leash sessions, like playing tug,fetch or passing time with their canine buddies is another way for dogs to remain active in winter.. When heading out for a walk, dress your dog in a sweater or coat. This helps retain body heat and prevents skin from getting dry or inflamed. For cats, consider games like chasey, with a piece of string or a bit of ribbon to help them stay fit and healthy. Want more tips on how to look after your furry companion this winter? Tune into JOY 94.9 tomorrow from 12pm for the Pets-A-Loud Winter Pet Care program.